It is now well documented that babies can hear before birth so this CD has been designed with babies in mind. Baroque music is gently played in the background to relax the baby and so aid their absorption of the sounds. Speakers are all native Spanish speakers. It is recommended that you play it daily from 6 months pregnant, just as you would a music CD. 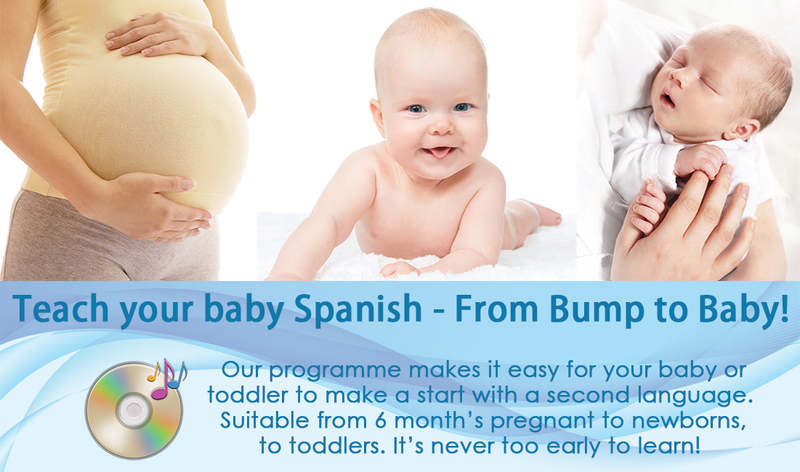 When the baby is around 6 months old, drop to 3 or 4 times weekly and gradually down to once weekly. This is merely a guide, you know your baby best. Make it fun, smile, laugh, join in. In section 4 of the CD you can walk or jump and in section 5 you can point to your eyes, nose etc. Its running time is approx 25 minutes. Try to learn a little yourself and ask friends and relatives to join in. Surround them with other Spanish CD’s and DVD’s. Try to find a Spanish speaking family. You can download the CD translations here: Spanish Translations.